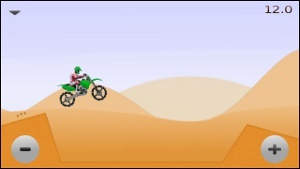 Motocross Masters is a motocross game with good physics. Game includes 42 exciting levels with gold, silver and bronze times. Trying to beat those will provide a lot of fun for a long time. Tilt your phone to control the driver position and bike angle. Start playing Motocross Masters and Let the Dirt Fly!